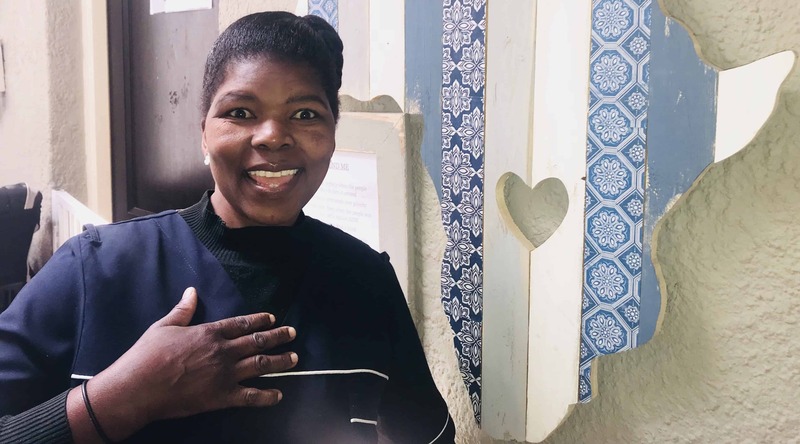 Hailing from Swaziland and Mpumulanga, we introduce the patient and loving Mama Thandi, who is our full-time House Mother for the “Masingita” House. (“Masingita” means “Miracles” in Tsonga). Mama Thandi looks after 7 of our wonderful children, 3 sets of siblings and 1 little boy. She has 5 boys in her house and 2 girls aged between 2 years old and 6 years old. Mama Thandi, aged 52, is a mix of Swazi and Zulu and is a qualified caregiver with First Aid Training. She does not look her age and says that her secret to staying young is to love your work! Thandi has been with us for the last 10 years and has been a faithful and consistent Mama to our children. Thandi is a mom of 2, and Gogo (Grandmother) of 5 grandchildren, whom she enjoys spending her spare time with. She joined Hearts of Hope because she is passionate about children and her best part of the job is seeing the children transform under her care. “I love the children, that is why I am here”, says a proud Mama Thandi.